The penultimate race (Meels) of this eleven race series took place on Thursday 15th June with almost 200 runners taking on the challenge. Springwell RC’s ever present representative Colin Brennan finished 51st in 39.17 and 6th M50. Thursday evening was also the Antrim Festival 10k which started and finished at the Junction One shopping centre. Springwell RC had four representatives from the Ballymoney group make the journey to Antrim for the event. Elaine Montgomery finished 45th in 57.29, Catherine Byers was 46th in 58.43, Monica McClenaghan finished 58th in 1.04.01 and Kenny Bacon 62nd in 1.07.00. On Friday 16th almost 700 athletes made their way to Comber in County Down for the 3rd annual Ballydrain Harriers 10k Road Race. This was the second year of the new flat and fast course, which was also round eight of the Novosco 10k Grand Prix series. David O’Flaherty (Newcastle AC) and Lindsay Gordon (North Belfast Harriers) matched each other stride for stride through the two lap race coming very close to the course record of 32.16 set in 2016. At the finish David took first place in 32.30 with Lindsay second in 32.35. In the battle for third, Ben Morrow (Ballymena Runners) narrowly beat Paul Rowan (Willowfield Harriers) and Paul Carroll (Annadale Striders) to secure third place in 34.10. In the ladies race pre-race favourite Amy Bulman (Willowfield Harriers) was the most impressive performer. The Northern Ireland international cross country runner led the way in 37.07 to secure first place. Catherine O’Connor (East Down AC) crossed the line in 39.14 for second place, while in-form Susan Smyth (Dromore AC) recorded 39.26 for third place. Springwell RC’s Bryan Edgar ran 38.23 for 31st place and third in the M50 category. Club mate James Stewart matched his time of 38.23 for 32nd and 7th M35. Margaret Edgar ran 56.18 in 441st and 11th F50. On Saturday 17th June over three hundred athletes turned out for The Loup 10k and 5k races, between Moneymore and Magherafelt. Weather conditions were excellent and the 10.30am start time meant that the runners avoided the heat which followed later in the day. In the 10k Aaron Meharg and Darrell McKee from Acorns AC battled it out, with Aaron just edging it over the final metres to win in 34.20. Darrell secured second in 34.21, before Glenn Donnelly, another Acorns AC athlete completed the top three in 35.23. Acorns AC continued their dominance in the ladies race with Leanne Sands winning comfortably in 44.51. Ciara Goddard (Acorns AC) took second in 45.37, while Laura McErlain (Magherafelt Harriers) prevented a clean sweep of the podium places by Acorns AC when she crossed the line in 46.55 for third place. In his first appearance for Springwell RC Shane Elder finished 23rd in 45.58 and Colin Connolly 85th in 59.08. Wednesday 16th June saw the latest in the East Antrim Marathon series which consisted of six laps from the Loughshore in Carrickfergus to Gideons Green in Newtownabbey. Springwell RC’s Helena Dornan had an excellent race finishing 7th overall and 1st lady in a time of 4.06.08. It was a beautiful morning for the weekly Portrush parkrun and the low tide left conditions quite firm underfoot. Pearl Dooley was congratulated on her nomination as parkrunner of the month for April. This week 226 people ran, jogged and walked the course, of whom 42 were first timers and 22 recorded new Personal Bests. Representatives of 25 different clubs took part. Portrush - Jude Moore 22.18, Mervyn Thompson 22.51, Thomas Close 23.10, Pamela Howe 24.07, Ronan Close 24.10, Paul Moore 24.30, Gemma Turley 25.06, Ali McAllister 25.40, Patricia Craig 25.51, Joshua Hazlett 26.15, Lauren Hazlett 26.20, Donna Costello 26.26, Sarah Chestnutt 00:26.31, Elaine Montgomery 27.48, Bob McLaughlin 27.54, Brenda Burns 28.10, Deborah Archibald 28.41, Jack Blee 28.51, Nichelle Atchison 28.58, Judith McLaughlin 30.10, Caitriona Mackle 30.11, Rachel Blee 30.43, Amy Dobson 30.54, Carolyn Crawford 30.55, Angela Calderwood 31.17, Kenneth Bacon 34.08, Lorraine Abernethy 34.10, Fiona Walls 35.57, Deborah Purdy 35.58, Alison Borland 36.14, Emer Thompson 52.15, Roisin Walker 52.39. 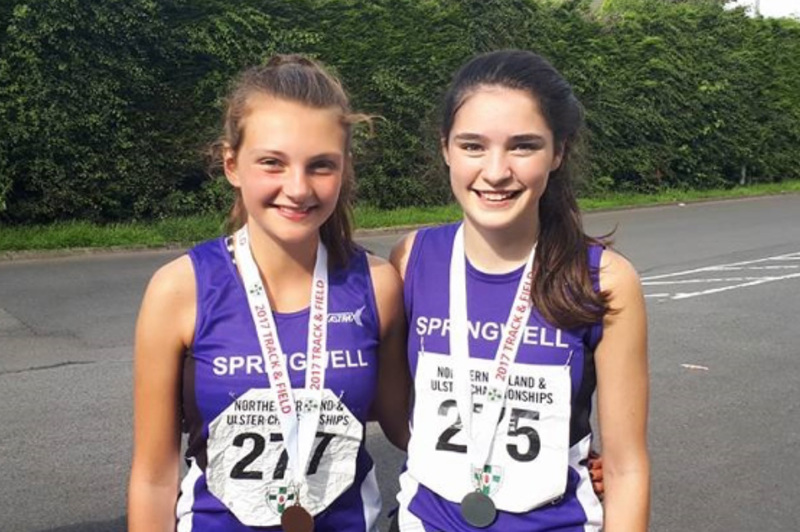 The Northern Ireland and Ulster Age Group Track and Field Championships took place on Saturday 17th June at the Mary Peters Track in Belfast with Springwell RC’c junior athletes producing some excellent performances producing six personal bests in very hot conditions. 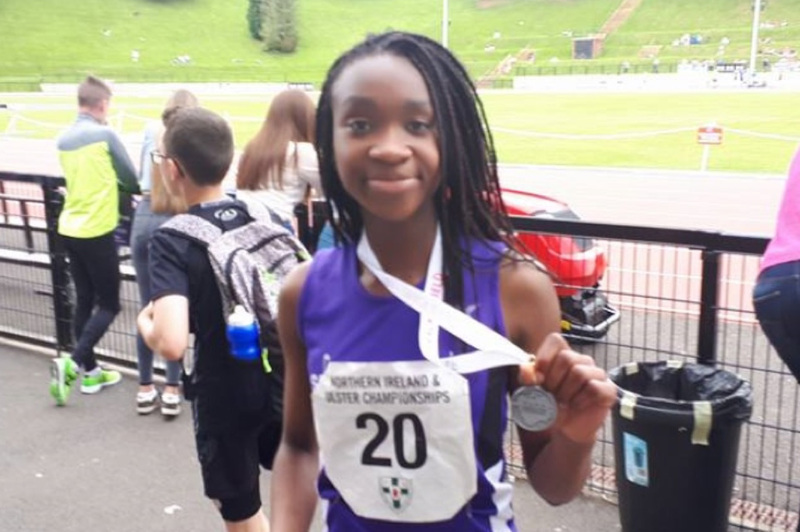 In the U14 800m Niamh McGarry took silver in 2.21.88 and in the U15 girls Tuloupe Jide-Ojo, running personal bests in both races took silver in the 100m in 13.46 and bronze in the 200m in 27.89. In the U17 800m Niamh Carr took silver in 2.22.94 and Hermione Skuce bronze in 2.24 .51.